How To : Conect iPod touch to internet via PC software router with Ultra Compact Wireless USB 2.0 Adapter （WLI-UC-GNM,WLI-UC-GNM2 series） - Details of an answer | Buffalo Inc.
With WLI-UC-GNM,WLI-UC-GNM2 series adapter, Buffalo provides a software router functionality for Windows OS. 1- Start by switching adapter mode to software router. Run Windows setup mode to switch to Software Router. Next, record the Wireless Profile (SSID, Encryption method and Key) setting for the PC based Software Router . 2- Turn on your iPod. If not at the home screen, press home button. Make sure the "Wi-Fi" button is ON. Wait for a while until the SSID searching gets completed. 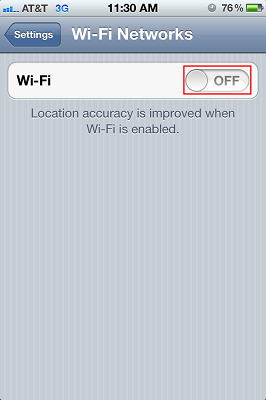 *If the "OFF" button appears, a wireless feature is disabled. Tap the button to enable a wireless connection. Swipe the toggle switch to ON. 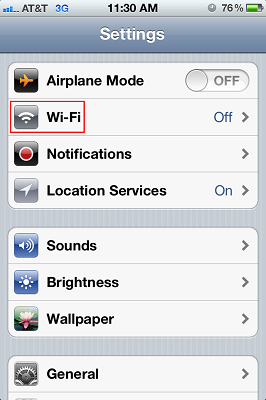 5-Tap the SSID from the Step1 under "Choose a Network...". If the SSID cannot be found, scroll the list to check it. *A key symbol appears because the wireless connection is encrypted. 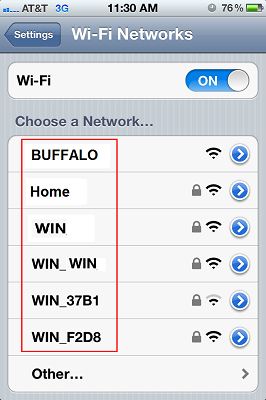 If not broadcasting your ssid choose "other" under 'choose a network'. Under 'name' type your ssid. 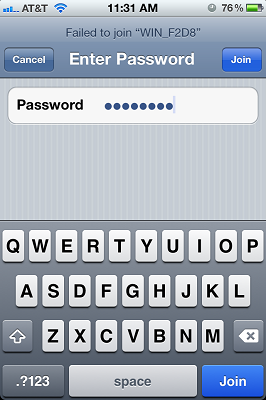 6-The screen to enter an encryption key (password) appears. Tap the encryption key written down from the Step 1. Then tap [Join]. If you are successful, a checkmark next to your wireless router's SSID on this list is indicated. 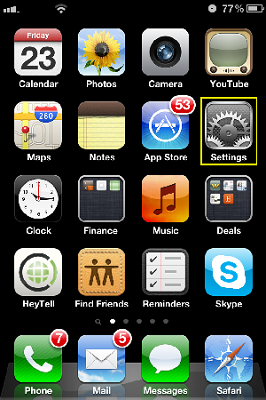 also a wireless status indicator icon on the top status bar, next to your clock is displayed.